An American expert on Tibetan Buddhism shares insights on a classical text on dying. For centuries, The Tibetan Book of the Dead has been read aloud to the dying—who Buddhist masters say are capable of hearing up to three days after clinical death—as a guide through the tumultuous and often terrifying process of dissolution. 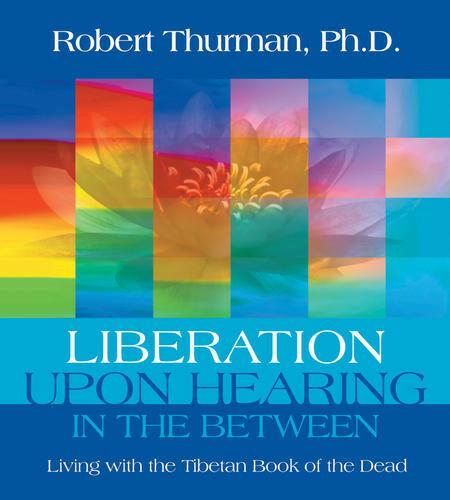 Now, in Liberation Upon Hearing in the Between, distinguished Tibetan Buddhist scholar Robert Thurman illuminates this classic text with up-to-date insights for modern audiences. Professor Thurman demystifies this esoteric teaching and reveals the Tibetan view of dying: it is not an ending to be feared, but a wondrous and liberating culmination of our life's journey, potentially opening into glorious new beginnings. Entering the bardo—the in-between state in which one reality dissolves and the next has not yet formed—we need not become prey to our fears and hopes. Instead we can relax into our natural clarity and stabilize the journey. This treasured teaching is for much more than just changing our understanding of death. Whether we have lost a dear relationship, awoken from a dream, or face the loss of our bodied life, simply hearing these teachings steadies our minds and hearts so that the journey from one state to the next changes from a tragic voyage into a clear adventure through the brilliant sky of great liberation.